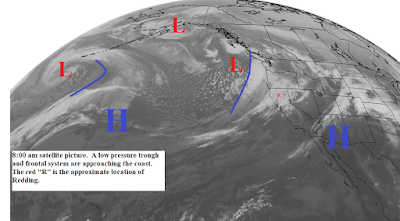 The low pressure area is now over Southern Oregon and is continuing to move slowly eastward. Today there will be some clouds and a few showers over higher elevations north and east of the valley. The rest of the area will be partly to mostly sunny with slightly warmer temperatures. 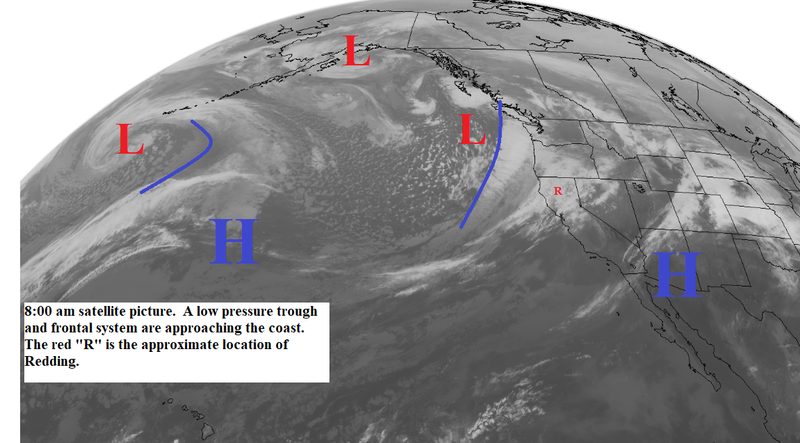 Tuesday high pressure builds along and over the west coast and will hold there through at least Friday (see map below). Skies will be sunny and temperatures will be above normal by Wednesday. Gusty north winds are expected Tuesday and early Wednesday. Saturday and Sunday the high will weaken slightly as a weak upper level low pressure area brushes the north end of the state. This low could trigger a few thunderstorms over the northern and eastern mountains. The low pressure area is now along the Northern California and Southern Oregon coast and is moving slowly east-southeastward. This system will bring scattered showers and thunderstorms to the foothills and mountains of Northern California today with isolated activity in the valley north of Red Bluff. Sunday the showers and thunderstorms will be over higher elevations north and east of Redding with a slight chance of one dropping across the far north end of the valley. Monday most areas will be partly to mostly sunny but there will still be a few lingering showers along and east of the Sierra Cascade Crest. 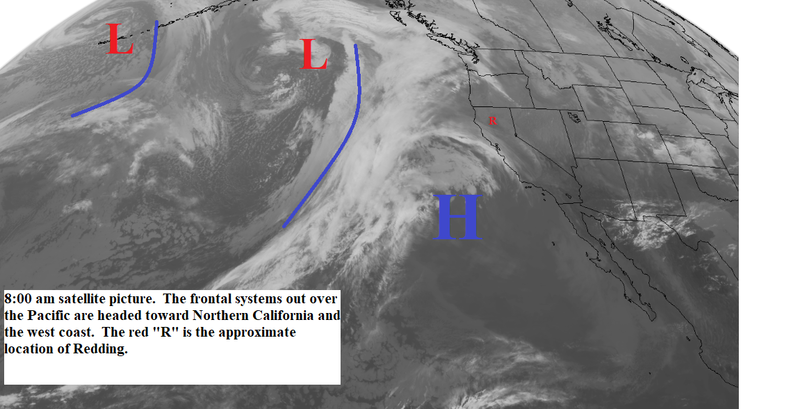 Tuesday through next weekend high pressure will be back along and over the west coast (see map below). During this time we will have sunny skies with above normal temperatures. Gusty north winds will occur Tuesday and Wednesday. High pressure is still over the west coast and today will be a repeat of yesterday. 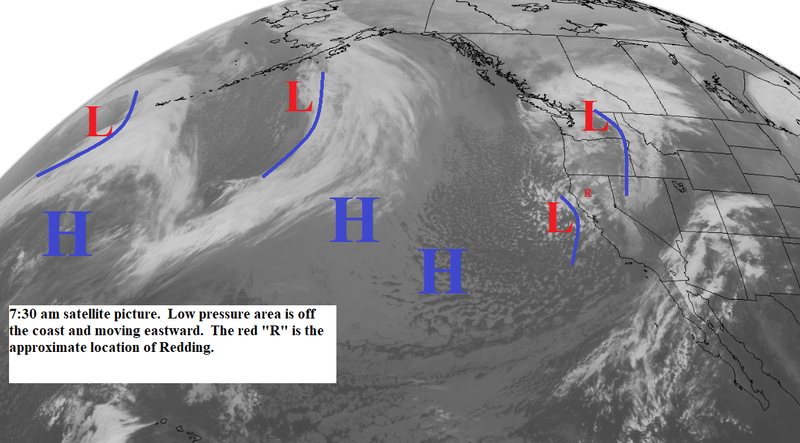 This morning's satellite picture (below) shows that the closed or cutoff low has formed out to our west. 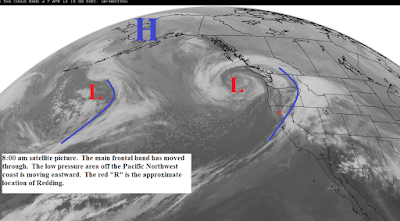 This system will drift slowly eastward and will be over Northern California by Saturday (see map below). Thursday we will see an increase in afternoon cumulus over the mountains with a few thunderstorms possible . Temperatures Thursday will cool but still be above normal. Friday and Saturday scattered showers and thunderstorms are expected over the foothills and mountains. Isolated thunderstorms are possible in the valley Friday and Saturday afternoon and evening. Temperatures Friday and Saturday will be a few degrees below normal. Sunday the the thunderstorms will be confined to the higher elevations as the low moves east of our area. Monday high pressure rebuilds along the coast and by Tuesday and Wednesday we will be back to sunny skies with above normal temperatures. High pressure continues over the west coast. Today through Wednesday we will see mostly sunny skies with above normal temperatures. In the Saturday blog I discussed the formation of a closed or cutoff low. This morning's satellite picture (below) shows a frontal system out in the Pacific that is stretched north to south. The low will form on southern end of this front and the drift slowly eastward. This low will be nearing the coast by Friday and over the north state Saturday and Sunday (see map below). Thursday we will see afternoon clouds with showers and thunderstorms over the mountains. Friday through the weekend we will see partly cloudy skies with scattered showers and thunderstorms mainly over the foothills and mountains but with isolated activity possible in the valley. Temperatures will cool to below normal by Friday and remain there through the weekend. Skies clear out and temperatures return to normal Monday and Tuesday. High pressure is along and over the west coast and will hold there through midweek. During this time Northern California will be mostly sunny with some afternoon cumulus clouds over the mountains. Temperatures will be 6 to 12 degrees above normal and winds will be light. A "cutoff" or "closed" low pressure system is one that forms when a portion of a low pressure trough cuts off from the main jetstream and sinks southward. These are common during the spring and summer. Without the jetstream or strong steering winds these lows tend to move slowly and erratically. A cutoff low will be off the coast by late Wednesday and over the next several days will progress slowly eastward (see map below). 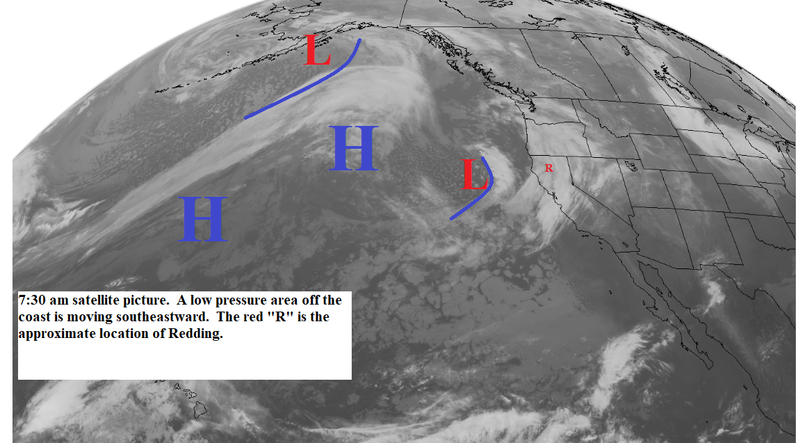 The low does 2 main things...first it destabilizes the atmosphere as it approaches the coast and second the southerly flow ahead of it will sometimes pull sub tropical moisture northward. Wednesday we will see the afternoon cumulus clouds begin to increase. Thursday and Friday there will afternoon and evening thunderstorms over the mountains with temperatures cooling to near normal. Saturday and Sunday the low will be close to or over the north state and there will be thunderstorms over the foothills and mountains with isolated activity in the valley. A low pressure area is off the coast and is moving southeastward. 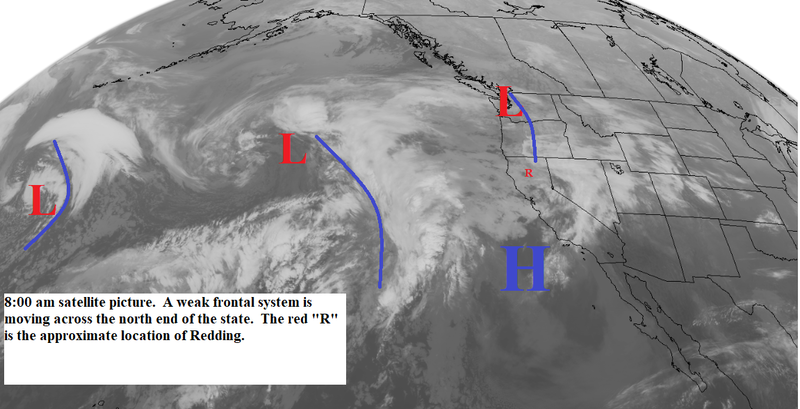 This system will move inland over Central California later today and tonight. Northern California will have a few light showers mainly over the foothills and mountains with isolated showers in the valley. Snow levels will be 5000 feet. The showers will end tonight with clearing skies early Thursday. 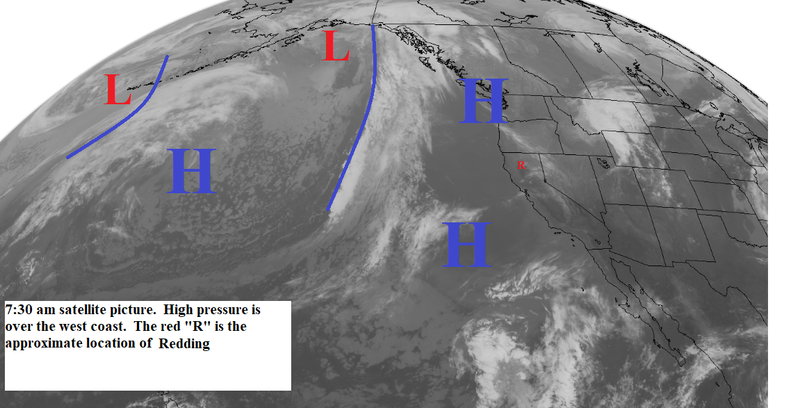 Thursday afternoon through the mid part of next week high pressure will be along the west coast (see map below). The north state will be mostly sunny with temperatures running 6 to 12 degrees above normal by the weekend. Gusty north winds are expected Thursday and Friday. It looks like a closed or cutoff low pressure area will develop off the coast late next week. This would increase the chance of showers and thunderstorms. Nice weather today with sunny skies...above normal temperatures and light winds. 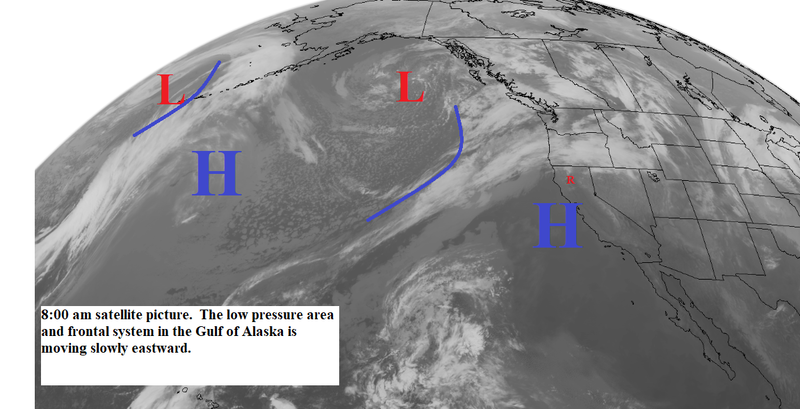 However, this morning's satellite picture (below) shows the next low pressure area and frontal system in the Gulf of Alaska moving slowly southeastward. This system will spread rain over the area Sunday with scattered showers and possible thunderstorms Monday. Snow levels will drop to 5000 feet by Sunday afternoon and on Monday in some of the showers the snow levels will be 3000 to 3500 feet. Tuesday will be partly to mostly sunny. Wednesday a weak low pressure area will move through Northern California (see map below) with light rain over the foothills and mountains and a few showers in the valley. Snow levels will be 5000 feet north and 6000 feet south. Thursday through the weekend we will have a weak high pressure ridge along the coast. This will push the jetstream northward. The northstate will see partly to mostly sunny skies with a few clouds at times from storms moving by to our north. Temperatures will be normal to a few degrees above normal. The jetstream or storm track is continuing to drop southward. We will see several frontal systems move across the north state over the next week. Today a very weak system is bringing a few light showers to the higher elevations north of Redding. Thursday a stronger system will spread light rain or showers across all of the north state. Snow levels will be 6000 feet or higher. Friday and early Saturday a strong (for this time of year) low pressure trough will move across Northern California (see map below). Moderate to locally heavy rain is expected, with snow levels continuing 6000 feet or higher. Strong gusty south winds will occur Friday evening and early Saturday with gusts 40 to 50 mph in the Redding area and 60 mph over the higher elevations. The precipitation will turn to showers Saturday and end by evening. Snow levels Saturday will drop to 4000 to 5000 feet. Sunday and most of Monday will be partly to mostly sunny. Late Monday and Tuesday another low pressure trough will move through the area with more rain and wind. Snow levels will be 5000 to 6000 feet. it looks like another system will hit the area late Wednesday and Thursday.